The drought is expected to be worse for California’s agricultural economy this year because of reduced water availability, according to preliminary estimates released today by the UC Davis Center for Watershed Sciences. The study, prepared for the California Department of Food and Agriculture, says the total cost of this year’s drought on California’s economy as a whole will be $2.7 billion and the loss of about 18,600 jobs. Farmers will have 2.7 million acre-feet less surface water than they would in a normal water year — about a 33 percent loss of water supply, on average. The impacts are concentrated mostly in the San Joaquin Valley and are not evenly distributed; individual farmers will face losses of zero to 100 percent. As with last year, groundwater, global markets and water markets are greatly reducing the economic impacts of the drought on California’s agriculture and consumers worldwide. Still, considerable local suffering will remain in harder-hit areas. Photo: From left, Jay Lund, Josue Medellin-Azuara and Richard Howitt of the UC Davis Center for Watershed Sciences. 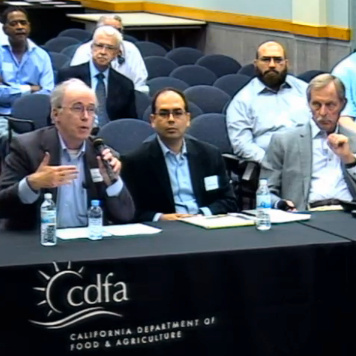 The three researchers presented the drought impacts report todau (June2) at a public meetinfg of the California State Board of Food And Agriculture.